10th Floor, 80 Grosvenor St.
Our four provincial organizations — the Canadian Mental Health Association, Ontario, the Ontario Federation of Community Mental Health and Addictions Programs, the Ontario Hospital Association, and the Schizophrenia Society of Ontario — applaud the Government of Ontario and your Advisory Group for focusing on two key initiatives that will significantly impact the health care experiences of people with mental health and addiction needs. 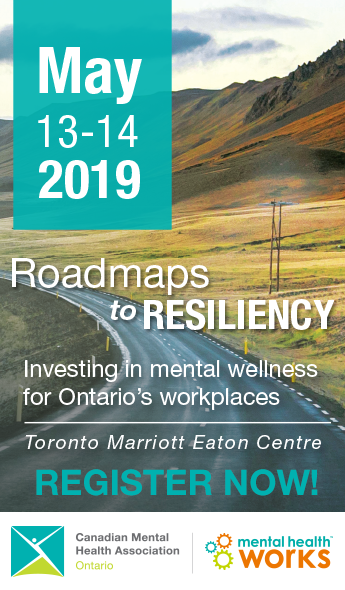 These two initiatives, the reduction of Emergency Room (ER) wait times and the transformation of Ontario’s mental health and addiction system through the development of a 10-year strategy, are intrinsically linked. Making improvements across the continuum of hospital and community services will, we anticipate, lead to decreased ER wait times for this patient population and ensure the most appropriate services and supports are provided for people with mental health and addictions needs. Each of our organizations has provided input to the Ministry on strategies to reduce ER wait times for people with mental health and addictions needs. Together, we represent most of Ontario’s community mental health and addictions agencies and hospitals, and we can offer a wealth of expertise in strategic policy development and service delivery in this area. We have committed to work collectively in the coming months to move forward on the implementation of some of these strategies. Our organizations agree that ER wait times for people with mental illness and addictions need to be addressed through a system approach. Together, we make the following recommendations to effectively reduce ER wait times for people with mental illness and addiction. A significant proportion of individuals who present to the ER with mental health and addiction needs do not need ER care and could have their needs more appropriately addressed in the community, if effective alternatives existed. The capacity of the community mental health and addictions system must be strategically increased, to ensure that more expensive ER services are only used when appropriate and necessary. Addressing the need for community-based crisis services: Many individuals with mental illness and/or addiction who present to ERs are in psychosocial crisis. A comprehensive, 24-hour community-based crisis response system including crisis intervention teams, safe beds, transitional case management and peer support can meet individual needs for crisis stabilization and recovery support.1For individuals in psychosocial crisis, non-medical models of crisis intervention may be sufficient. Medical models of community-based crisis services, which involve interdisciplinary teams with the same standards and expertise as found in hospitals, should also be explored. In order to be an effective alternative to ERs, community-based crisis services must be available 24 hours a day, accessible across the province, and have direct links to both community agencies and ERs. Improving access to appropriate mental health and addiction supports in the community: In order to decrease pressure on the ER, community mental health and addiction services must be more accessible, especially during evening and weekend hours. Case management, peer support and warm lines have all been shown to effectively support people in their recovery and prevent crisis from developing. Non-medical programs for alcohol and drug crisis management and managed alcohol programs should also be expanded to provide people with options based on their needs. Recognizing the need for social supports such as housing, income and employment: Poverty, unemployment and unstable housing are factors known to contribute to mental health crisis.2 Social supports such as supportive housing and income assistance support recovery and assist people with mental illness and addictions to stay healthy in their communities. Hospital capacity needs to be calibrated to ensure people with mental health and addictions needs who require ER services are treated in a timely manner. Improved hospital-community coordination and collaboration around alternative models of ER and inpatient service delivery can reduce need for inpatient care, facilitate continuity of care upon discharge, and prevent repeat ER visits. Developing alternative models of emergency room service delivery: Human resources improvements, such as the placement community-based crisis workers in ERs, can improve wait times for people with mental health and addictions needs, reduce repeat ER visits, link people in crisis with community alternatives, and provide support to individuals and families in crisis. Development of and adherence to triage protocols for patients presenting with mental illness or addiction-related concerns will also vastly reduce wait times for this population. Other models which could be explored include short stay or extended observation beds in the ER for patients who do not need long-term admission but require observation, reducing lengths of stay for individuals who would otherwise be waiting for a bed. Implementing ER diversion programs in high volume ERs: ER diversion programs, which put community mental health and addiction workers directly in the ER, have proven effective in redirecting those who do not require ER services to more appropriate community-based services. Diversion programs are effective because they can facilitate direct placements into community programs and ensure patients do not fall through the cracks, thereby reducing the likelihood of a return to the ER after a short time. Family health care is often the first point of contact with health services in Ontario. Yet, only a minority of Ontarians with a diagnosed mental illness reported having made contact with any ambulatory health care professional for mental health reasons.4 Many Ontarians with mental illness or addictions lack access to family health care, thereby preventing them from getting primary care for either physical or mental health needs or from getting a referral to a psychiatrist. Wait times to access community-based psychiatrists is also an area of concern. Limited access to medical care in the community can result in overuse of ER services, adding to volume and resulting in increased wait times. Improving access to family health care for people with mental health or addictions needs: Primary health care programs targeted to individuals with serious mental illnesses can reduce ER visits by providing a more appropriate setting for mental health care.5 Expanding interdisciplinary models such as Family Health Teams, Nurse-Practitioner Clinics and Community Health Centres, as well as supporting co-location and other collaborative service models with community mental health agencies, can enhance access to primary health care for individuals with mental health and addictions needs. Expanding mental health training and supports for primary health care providers: Appropriately trained family health care providers can better identify mental health and addictions problems in order to act early and intervene appropriately. This can also create a safe and supportive environment for people who seek treatment. Multi-sectoral and team-based approaches, such as collaborative mental health care initiatives and collaboration between primary care and community mental health agencies, exist across Ontario to provide support to primary care staff as well as direct service delivery in family health care settings. Increasing access to specialist mental health services:In 2004, there were 13.1 psychiatrists practicing per 100,000 Ontarians, with greater concentrations practicing in large urban settings and a lack of psychiatrists in rural and northern communities.6 People with mental illness often wait several months to see a psychiatrist after a referral has been made, preventing people’s needs from being met in a timely manner. This can result in inappropriate use of ERs as an alternative. Attached, you will find our organizations’ briefs on ER wait times for people with mental health and addictions needs. They provide further information on the strategies highlighted above and we welcome the opportunity to discuss these strategies we commonly believe will address ER wait times for this population. Ontario, Crisis Response Service Standards for Mental Health Services and Supports, Ministry of Health and Long-Term Care (Queen’s Printer for Ontario, 2005), no. 7610-2243054. At one hospital in London, Ontario, up to 13% of people with mental health and addictions needs presenting to the ER were seeking care for social-structural stressors such as housing and legal and financial issues. See R. Corisitne, K. Hartford, E. Vingilis and D. White, Mental Health Triage in the ER: A qualitative study, Journal of Evaluation in Clinical Practices 13(2):303-309, 2007. E. Jensen, C. Forchuk, P. Witcher, A. Davis, B. Seymour and P. Chapman, An Evaluation of Community Based Discharge Planning: Report. Systems Enhancement Evaluation Initiative, 2009. A.E. Rhodes, J. Bethell, and S. E. Schultz. Primary Mental Health Care. In L. Jaakkimainen, R. Upshur J.E. Klein-Geltink, A. Leong, S. Maaten, S.E. Schultz and L. Wang, editors Primary Care in Ontario: ICES Atlas. Toronto: Institute for Clinical Evaluative Sciences, 2006, pp. 141-160. A community health centre targeted to individuals with serious mental illness and co-located in a community mental health agency in Windsor saw a 50% reduction of ER visits by their clients. See T. Doey, P. Hines, B. Myslik, J.E. Leavey and J.A. Seabrook, “Creating Primary Care Access for Mental Health Care Clients in a Community Mental Health Setting,” Canadian Journal of Community Mental Health 27 no. 2, 2008:129-138. J. Durbin, E. Lin, B. Rush, K. Thibault and B. Smith, Impact study: Mid term report, System Enhancement Evaluation Initiative, Health Systems Research and Consulting Unit, Centre for Addiction and Mental Health, 2007.